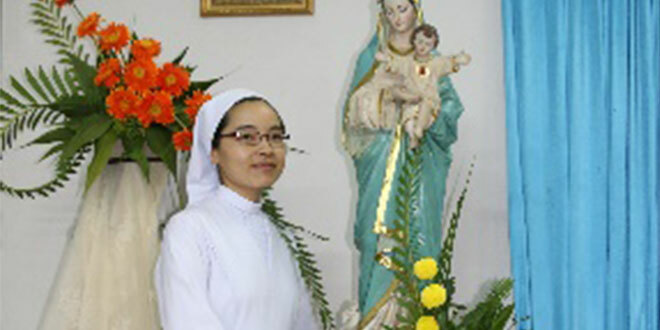 Love: Sr Teresa Rose at the Saigon novitiate of the Sisters of St Paul de Chartres in Vietnam. NO matter how long I have followed Christ in religious life, I am officially called a Sister of St Paul de Chartres only from the day I took the religious habit – to “put on Christ”. After almost one year of formation in the postulancy, I received my religious habit on July 25 last year in Saigon novitiate in Vietnam, which is so special since I am a member of the Sisters of St Paul de Chartres in Australia. It helps me to understand more deeply that the SPC Sisters are an international and missionary congregation and where the sisters are serving and ministering, we are all one. The rains in that afternoon were just like the dew of grace that God has poured out onto me, as well as to my family, and above all to the Church and the congregation. When I said “yes” to God’s call, this was what I first thought about. And I desire to follow him forever. I felt everything was so smooth, so gentle and warm. That real joy and happiness had overwhelmed me and had cast out all fears, hardships and trials that I had experienced as necessary parts in my training process. I want to live from now on, a life of perpetual gratitude to God for all he has done to me and for me. Though it is nothing compared with his gifts of salvation and life, but “God loves the cheerful giver”. He will cherish the little with great love. Thank you, Jesus, for imprinting the seal of love onto my heart so I can be strengthened and can confidently soar with you in the sky of love. Sr Teresa Rose is a Sister of St Paul de Chartres in Australia.